Had sizes 7-12 at time of posting. £45 minimum, i picked a shoe and price shot up to £75 in limited colours. lol the op changed the sizes! but andywedge had checked the deal and posted within 10 seconds of me posting! eager beaver! I really wanted dark beige ones but the're the leather ones. Prefer the nubuck ones myself. Be aware, these sizes arn't normal shoe sizes. After trying them on instore I actually ordered 2 sizes smaller than my normal trainers! I really wanted dark beige ones but the're the leather ones. Prefer the … I really wanted dark beige ones but the're the leather ones. 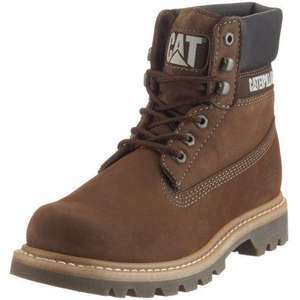 Prefer the nubuck ones myself.If its any use to anyone found these for not too much more:http://www.beanbone.co.uk/shoes/344722-cat-footwear-mens-colorado-dark-beige-boot-708190-8-uk-0-0098776292798.htmlBe aware, these sizes arn't normal shoe sizes. After trying them on instore I actually ordered 2 sizes smaller than my normal trainers! Damn I ordered size 9 Thing is in the past i've changed shoe sizes to ones people say as they are either bigger or smaller than usual and got burnt due to my weird feet...I'll put on 10 pairs of socks if they are wayyyy to big. Damn I liked the look of the other pair, is it bad that they are leather, or is it just your preference. Just my preference mate. Dont like the shine of the leather. If they're too big you can send them back. Amazon do free returns. ordered - have some heat.... just hope ive ordered the right size for my other half. order 10 (he's usually 10 or 11).... fingers crossed. I already have a pair in a different colour. I'm usually a size 9 (sometimes a 10) and a size 8 of these is plenty big enough for me so order a size smaller! Be aware, these sizes arn't normal shoe sizes. After trying them on … Be aware, these sizes arn't normal shoe sizes. After trying them on instore I actually ordered 2 sizes smaller than my normal trainers! Great point. Snagged some muddy transforms last week. I usually take a 10 and scooped the 8 from debs, bargarooni. All the 9 and 10 buyers who felt they got lucky will be like WTF there is room for a small family beyond my toe area. ALL CAT BOOT SIZES ARE TWO SIZES TOO BIG. EMAIL THIS TO FIFTY PEOPLE TODAY FOR GOOD LUCK AND A GOOD FIT. Damn from the reaction thats far too many people for my liking saying size 9 is too big for normal size 9 people....in the middle of cancellation and ordering size 8's...fingers crossed it goes through and that when they arrive they aren't small as I've been hit before by silly sizes. I pair of beige leather ones on their way - fingers crossed on size. Just changed mine down to a size smaller than normal, I presume you did the same? Damn from the reaction thats far too many people for my liking saying … Damn from the reaction thats far too many people for my liking saying size 9 is too big for normal size 9 people....in the middle of cancellation and ordering size 8's...fingers crossed it goes through and that when they arrive they aren't small as I've been hit before by silly sizes. It's free delivery and free returns, so why not buy a size 8 and a size 9 and return the one that's not suitable? It's free delivery and free returns, so why not buy a size 8 and a size 9 … It's free delivery and free returns, so why not buy a size 8 and a size 9 and return the one that's not suitable? That's okay as long as they still have the size if/when you need to reorder. I've ordered both 8 and 9 and will send one back. Caterpillar, Bulldozing Palestinian homes since 2000:(. Would not buy, EVER, for ethical reasons! No matter the price. I've worn Cat boot for work for the last 18 years, I'm size 8 and a half and a pair of size 9 cats fit me perfectly, I did have some steel toe cap ones for a while and they were quite oversized to take account of the steel insert but the normal non-safety boots they do aren't generally two sizes too big, if you are uncertain or your feet are an in-between size I would order the next size up, not two sizes up! They are very well built and I've never had a pair fall apart on me, it usually takes 18 months to 2 years of daily wear for them to look too scruffy for me and then I get a new pair. Just had a look at all the reviews some people had sizing issues and went down a size, so seems it is the right decision to go down with these boots. I had forgotten about this. Order cancelled. Not sure I understand where people are going with the sizing thing. I wear size 10 in trainers and shoes, and size 10 in CAT boots fit me perfectly - got two pairs now and would always go for the same size in future? Dont think missing the deal is a good reason to vote cold. When it was posted, ALL sizes in Royal Brown were £45. Looks like they just changed it. got 1! hot for me!!! I've been wearing Cat Colorado's for years. They are without doubt the most comfortable and hardwearing boot i've ever owned. But the sizes are spot on. I take a size 10, and a 10 in Cats fits me perfectly. I would say those ordering one or two sizes down are going to end with boots that are too small. These boots are just for show. Took my friend up on Dartmoor and he was wearing Caterpillars, his feet were soaked just from walking on wet grass after about an hour. After the 10 mile hike they were completely ruined. Funny thing is he paid £120 for them not £45.